Drawing inspiration from opulent Renaissance-era design and infused with modern luxuries worthy of L.A.’s brightest stars, Hollywood Banquet Hall is quite unlike any other event venue in Los Angeles. Replete with breathtaking crystal chandeliers, brilliant LED lights, custom-made décor, and a full-sized wood dance floor, Hollywood’s gorgeous 4,000 square-foot event space can comfortably accommodate up to 350 friends, family members, or colleagues, while the venue’s flexibility—including an extensive menu of fine Middle Eastern cuisine and an endless variety of decorating options—makes it ideal for nearly any event, from wedding ceremonies to birthday parties to business conferences. Don’t settle for an ordinary event venue experience; celebrate like a celebrity at Hollywood Banquet Hall. Breathtaking lighting, beautiful chandeliers, and a full-sized dance floor makes Hollywood Banquet Hall one of Los Angeles’ most popular wedding venues. In addition to the reception hall’s inherent beauty, Hollywood’s experienced wedding planners work closely with every couple to fully customize every aspect of the venue’s decorations, lighting, table arrangements, tables, tablecloths, table settings, and chairs. There is no request we cannot accommodate! With hundreds of ways to customize our glamorous banquet hall, Hollywood’s flexibility makes it ideal for any type of event, from elaborate wedding receptions to intimate business conferences. Allow our friendly, experienced event planners to help you choose the perfect lighting options, seating arrangements, and decorations to complement your special event, while Hollywood Banquet Hall’s extensive list of vendors puts some of Los Angeles’ best florists, decorators, bakers, photographers, and entertainers at your fingertips. Hollywood’s state-of-the-art LED lighting can be customized to perfectly match your wedding theme, the color of your Quinceanera dress, or your company’s brand identity. For functions without a predetermined color palette, our technical coordinators can adjust the lighting throughout the event’s duration to achieve different ambiances. 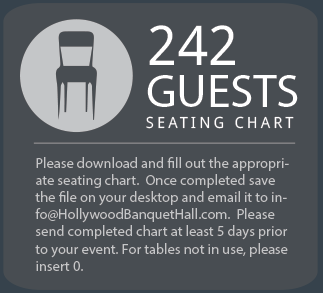 Though Hollywood makes a number of preset seating arrangements and corresponding floor plans available to our clients, the event venue’s layout can also be customized to accommodate almost any size and type of party. We’ll help you choose the right tables and chairs, as well as determine where your specialty tables will be placed. Custom centerpieces and flatware, colorful floral arrangements, full-sized banners, balloons, even all-white drapes to cover the walls—at Hollywood Banquet Hall, your decorating options are only limited by your imagination. Consult with our expert event planners to transform our beautiful event space into the venue of your dreams.